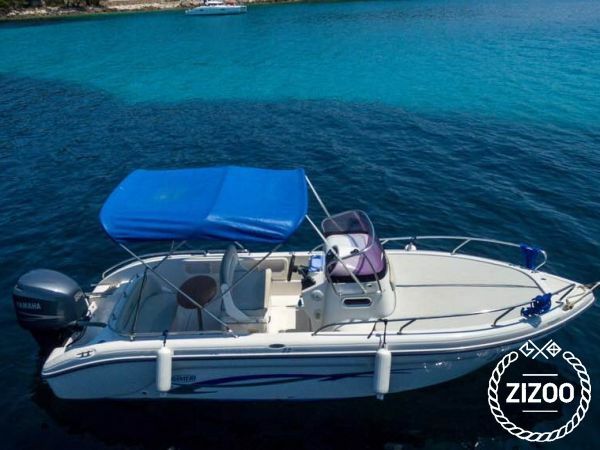 The motorboat Ranieri Shadow 22 is a cabin motorboat equipped with all you may need for a high class cruise around the Kvarner area and wider. The boat comes with a GPS and Radio with USB ports a compass a bimini top and much more for you to enjoy. The access to the cabin is from the cockpit part of the ship and the boat has a large sundeck in front a double seat in cockpit and a large sitting area with a dining table in the back of the boat. The boat contains all the neccesary safety and precaution items you need for safety. Ranieri Shadow is powered by a 200 HP Yamaha engine and it will comfortably fit 9 people on board. Ranieri Shadow is moored in Mali Lošinj, and island in the Bay of Kvarner surrounded from three sides by three great Croatian islands of Cres, Krk, and Rab. The boat thrives in daily exploration cruises but it can take two people to spend the night on board. The surrounding island provide numerous destinations for thi craft to take you to. If you do not have a skipper license do not worry, we will provide one for you on demand. All fuel costs are not included in the price.